Disc golf is perfect – or as close as can be – in so many ways, and gender neutrality can be counted among it’s strong points. Yet even though it’s growing rapidly among women, the number of guys that play still far outweighs the number of gals. That’s gotta change! The other blog where most of my posts here appear – RattlingChains.com – has for the second year in a row dedicated an entire week of coverage to women in disc golf. We think the ladies and girls who play really love the sport, and feel that others will love it too if they just give it a try. It always makes my day when I see a foursome of women on the course having a ball. My contribution to Women’s Week at Rattling Chains appeared here, in a slightly different version than at Rattling Chains, but in case anyone happens upon this site and is not a regular reader of Rattling Chains, I wanted to post links to the other stories as well. The week started with a profile of a 23-year old Swedish professional named Ragna Bygde. She was introduced to disc golf by her father and now has pretty lofty aspirations herself. 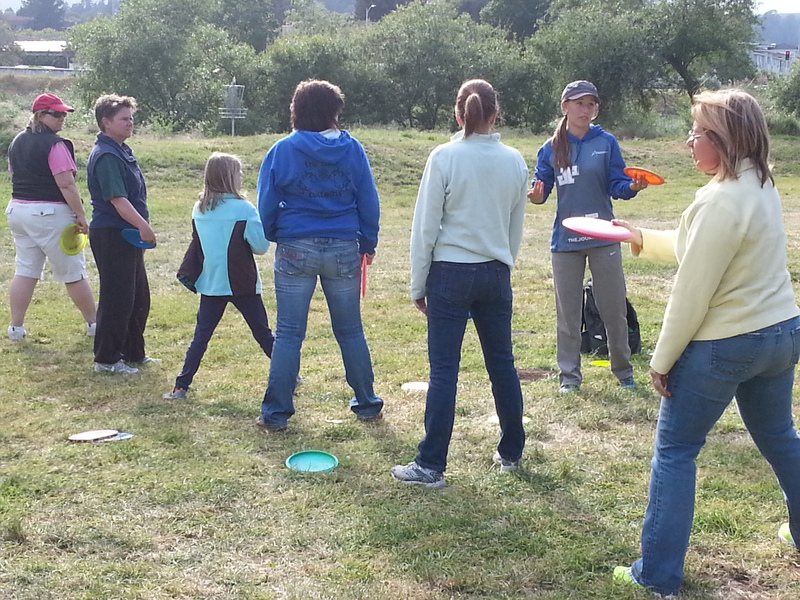 Next was my story, about a women’s disc golf clinic that my wife and two girls attended. My older daughter was so excited afterward that we attended a major pro event a few days later as spectators, following the top women’s group. The story that ran next profiled another dedicated female player named Kristy King. I happen know Kristy as she is also based in Santa Cruz, and the story focused on a certain disc golf tattoo she has that likely is unique to her and her alone, that symbolizes what disc golf means to her. Story number four of Women’s Week was written by a woman – frequent RC contributor Jenny Cook – about a disc golf entrepreneur and his efforts to promote the sport among women. You can read more to see how ‘The Disc Golf Guy’ is putting more than just lip service into his efforts to get women into tournaments and league play. The week wrapped up with a touching piece about a woman who went through a life-threatening medical issue and came through it in part thanks to disc golf and the local disc golfing community, who she considers a second family. If you are a female and play disc golf, feel free to share your experiences with us. What do you like about disc golf, and what do you think can be improved to help the sport appeal to more women? And any ideas to give it more exposure among the gender that makes up slightly more than half the world’s population is appreciated as well. Most guys agree that the more females that play, the better! If I had known it would be the subject of an article, I’d have approached this event much differently. We think and act much differently when we’re wearing our journalist hats (you know, the fedoras with ‘Press’ taped on the side). But I was just really excited that my wife and daughters had not only agreed to but were even looking forward to a disc golf clinic. At least – being in Dad Mode – I was quick to snap lots of pictures. 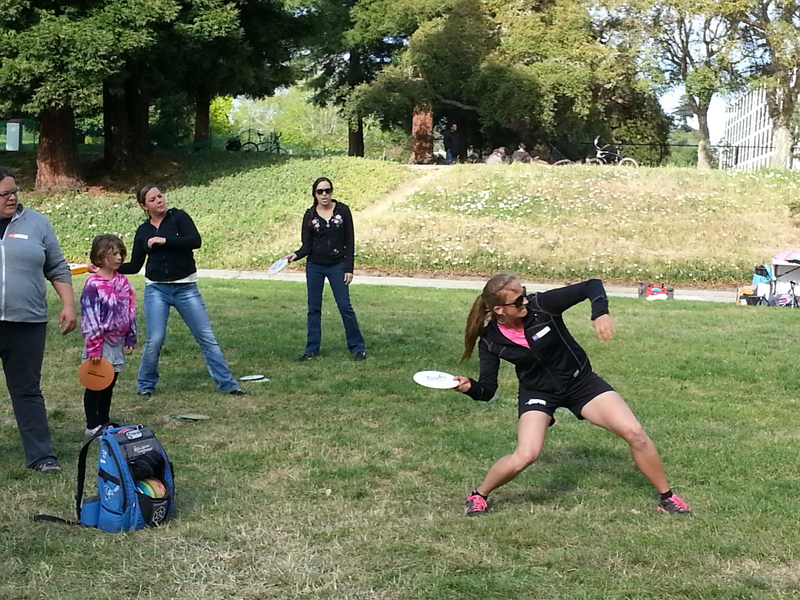 The event was a women’s disc golf clinic put on by Prodigy Disc team members Sarah Hokom and Paige Pierce in Santa Cruz, three days before the Masters Cup National Tour Event. The excitement came from the fact that I’ve waited for a long time for them to show interest in my favorite sport/activity/hobby/obsession. My wife used to play with me many years ago, before the kids came along, but it was always more about wanting to share something I loved. The kids have played a few times, but hadn’t gotten hooked into disc golf as of yet. The clinic was scheduled for 5 PM, and as it happened it was particularly windy (and cold) for Santa Cruz in April. As a disc golf instructor, I can assure you that these are not ideal conditions for teaching or learning the basics of flying disc sports. We arrived a little before 5 PM, and aside from one lady were the first on the scene. Slipping into my journalist mode (it happens subconsciously- or maybe I’m just curious/chatty) I asked her about what brought her there. She told me she was from San Francisco (a 1-2 hour drive, depending on traffic) and had played a week earlier in the Amateur Masters Cup event. The clinic was promoted during that week and during the Daisy Chains Women’s tourney in Santa Cruz County the week between the Am and Pro Masters Cup weekends. Clearly this clinic had been well-planned. I caught up with Sarah Hokom when she was already in Georgia for the Hall of Fame Classic on the PDGA HQ grounds, and asked her a few questions. She was understandably busy during the clinic, and as I mentioned already, I was more focused on watching my wife and kids. According to Hokom, the clinic was the fourth she and Pierce had conducted that year, with “at least a dozen” more planned to take place. She said that so far she has seen 10-15 participants at each event, and the number correlated to the level of local promotion. I didn’t count, but I thought I saw somewhere between 15 and 20. “I get all types of players,” said Hokom. “There have been new players at each one, seasoned players and all types in between. After waiting for 10 minutes past the listed start time to allow for those operating on ‘Santa Cruz Time’ to show up, they began by having the participants pair up to play catch and warm up. Good idea- especially on a chilly day. My younger daughter paired up with Pierce and took the assignment very seriously. After they warmed up, they broke into two groups, with Pierce teaching the basics of backhand throws and Hokom sharing the secrets of her deadly sidearm technique. As a fellow disc golf instructor I was impressed with the lesson in a couple of different ways. First of all, it was clear to me pretty quickly that some women are for whatever reason more receptive to instruction by other women. My wife and girls, for instance. They made some advances that afternoon that were really encouraging. And I don’t attribute it to just the ‘female connection’ thing- although that is significant. Hokom and Pierce made some great points that stuck with my older girl in particular, like Paige telling her to snap her backhand at the point of release. It’s not something I teach, but really helped my daughter throw with more armspeed. Paige Pierce of Prodigy Disc explains the basics of proper technique for backhand throws in disc golf. Photo by Jack Trageser. We had to leave early as the girls got cold, and it was a school night. 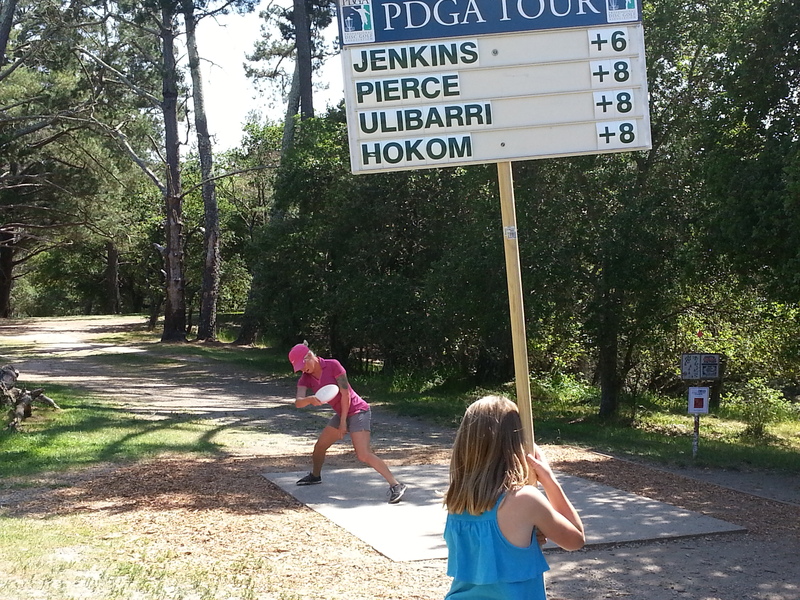 But the lesson had inspired my oldest, and she insisted we go out on the weekend to watch the women’s lead card of Pierce, Hokom, Innova Disc Golf team member Valarie Jenkins and eventual winner Catrina Ulibarri. I had figured on watching about an hour or so of the action. But my daughter – who at first rooted for Pierce after the lesson but then switched allegiance to Jenkins once she realized that Val and I were in Discmasters together, insisted on sticking there for the full 4.5 hour round. She was wearing a thin cotton tank-top and obviously cold (blame that one on Dad), but she was hooked on the action. And she got the full experience. All the women in the group signed a disc for her, she got to hold the leaderboard for short intervals, and Val in particular was gracious enough to acknowledge her repeated compliments and commiserations. A young fan holds the leaderboard and watches Masters Cup winner and Prodigy Disc team member drive on hole 7 at DeLaveaga Disc Golf Course. Photo by Jack Trageser. The clinic encouraged my wife and both my daughters because they all experienced noticeable progress in throwing straighter and farther than in the past. My older daughter had stars in her eyes after getting to see Pierce, Hokom, Ulibarri and Jenkins in action up close. I’m not sure which (participating in clinics or seeing top pros competing at National Tour event) has more potential to increase female participation in disc golf, but both seemed to be well-received by the women and girls that showed up. The trick is getting them there. Will disc golf ever be as popular among women as it is among men? 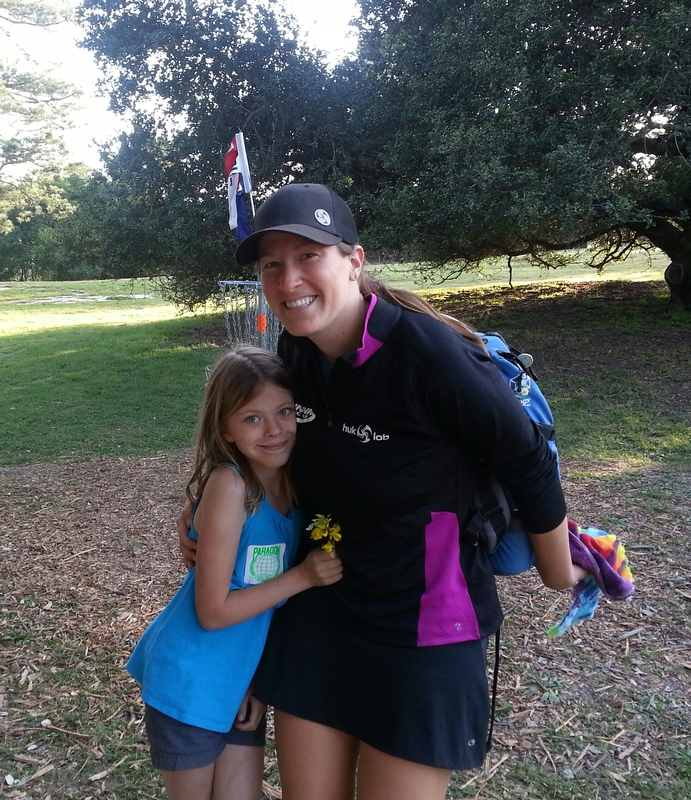 Valarie Jenkins poses for a picture with a young fan at the end of her round on the 2nd day of Masters Cup action at DeLaveaga Disc Golf Course in Santa Cruz, CA. Photo by Jack Trageser. Hokom said she is promoting the formation of ladies leagues because “I think they are helping the growth of women in the sport and provide a supportive and fun environment for more women to play.” Based on what I witnessed in April, and what the local female disc golfing population tell me, I’d say she’s right. Hopefully the trend toward women’s clinics, leagues and tournaments continues. I know at least one young girl who plans to show up.